Fifa is investigating the transfer payment for Emiliano Sala after Nantes made a claim against Cardiff City. 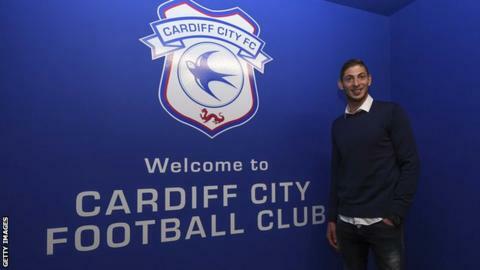 Argentine Sala, the Bluebirds' record signing, died aged 28 in a plane crash in the English Channel on 21 January. "We can confirm we have received a claim. We are looking into the matter," said a spokesman for world football's governing body. As Sala's move was an international transfer, it had to go through Fifa's mandatory system. Fifa president Gianni Infantino described the crash as a tragedy, and is hopeful Cardiff and Nantes can come to an agreement. He said they have Fifa bodies in place which can deal with such matters. A Cardiff spokesman said: "Cardiff City remains committed to ensuring fairness and accountability with respect to the agreement between Cardiff City and FC Nantes, but first and foremost the relevant authorities must be allowed to determine the facts surrounding this tragedy. But Cardiff said they were withholding payment until crash investigations were complete and they were satisfied about "anomalies" around the deal. Chairman Mehmet Dalman said Cardiff will be "honourable" with Nantes if they are contractually obliged to pay.